We don't think of comets as bad omens now, but that view would change if one were on a collision course with Earth. Comets definitely concern us. Scientifically, comets can help us to understand the Solar System. We can't interpret today's world without knowing its past. 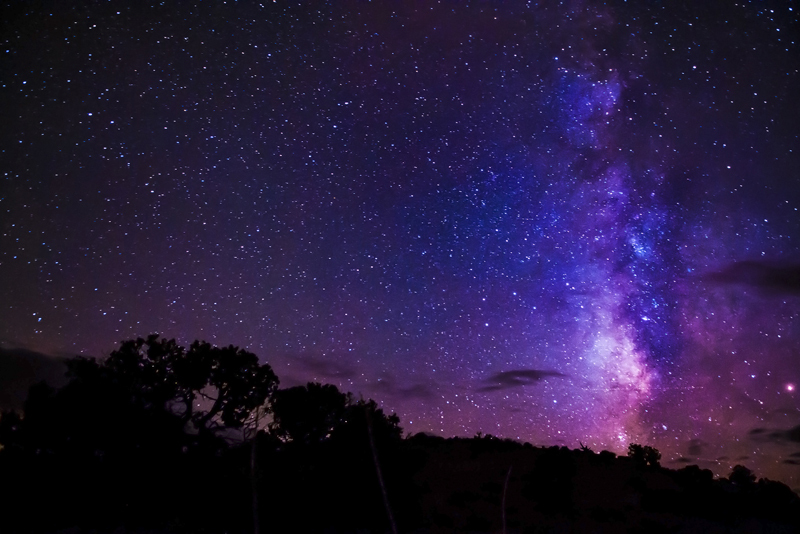 Comets formed far from the Sun and they contain unchanged material out of which the planets and other bodies were made. In addition, there is evidence that when comets bombarded the early Earth they brought water and elements that make up living things. A number of space missions have studied comets and asteroids. However none was as ambitious as the European Space Agency (ESA) mission to send a spacecraft to orbit a comet and release a lander. The spacecraft was Rosetta and the lander was Philae. The names are of two places in Egypt where stone inscriptions were found in the early 19th century. The inscriptions were in a known language and also in ancient Egyptian hieroglyphs, which hadn't yet been deciphered. The Rosetta stone was the key to the hieroglyphs, and the Philae obelisk helped to refine the translation. ESA hoped that their space mission might find a key to the evolution of the Solar System and the origin of life on Earth. ESA launched Rosetta in March 2004 after problems with the launch vehicle had delayed the mission by a year. The new target was Comet 67P/Churyumov-Gerasimenko. This comet had been observed on seven approaches to the Sun, so its orbit was well known. It doesn't get as close to the Sun as Earth's orbit, and at its most distant, crosses Jupiter's orbit. As the comet came into the inner Solar System in 2014, Rosetta would catch up with it and observe the activity as it warmed up. They didn't launch the spacecraft straight into the outer Solar System to chase the comet. There's no launch vehicle powerful enough to provide the needed acceleration, and the fuel costs would be prohibitive. ESA also wanted to test the instruments and systems before trying the difficult maneuvers with the comet. Therefore the mission objectives included fly-bys to observe two asteroids. Rosetta is the first craft to travel beyond Mars using only its solar panels to provide energy. 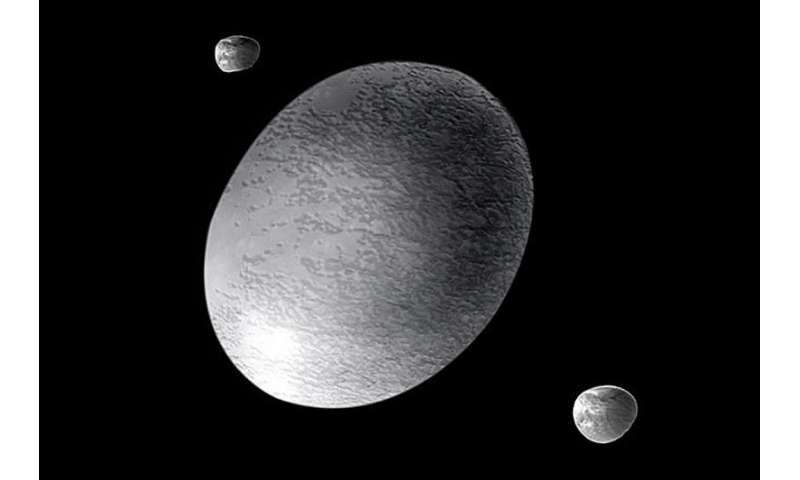 Other missions to the outer Solar System use radioisotope generators as a back-up. Rosetta went so far away that the amount of light available is only four percent of what we receive on Earth. A year after launch, the first swing-by got Rosetta to Mars. On the way, she observed NASA's Deep Impact impactor hitting Comet Tempel 1. But Rosetta's trajectory needed correcting, because comet 67P/C–G wasn't the same size or in the same orbit as the original target. Therefore ESA intended to use the Mars swing-by to slow Rosetta so that she would return to Earth at the right time for the next gravity assist. This needed more planning than usual because the craft would be flying very low above the Martian surface, only 250 km. Moreover for almost fifteen minutes she would be in the planet's shadow, out of touch with ground control and relying on battery power. Considering that the cost of the mission had been over a billion US dollars, this was a nerve-wracking maneuver. It was dubbed “the billion euro gamble,” but it paid off. 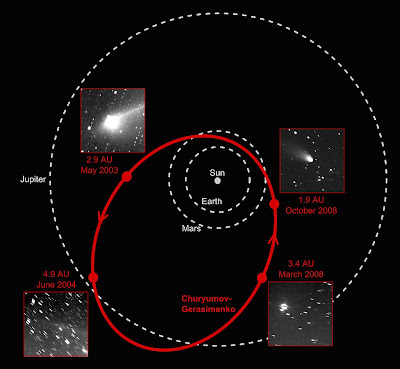 In September 2008 Rosetta observed asteroid Steins. Then after the final gravity assist, she was back in the asteroid belt in 2010, and scheduled to photograph asteroid Lutetia in July. On the way, there was also a chance to fit in an observation of a third small body: P/2010 A2. It had a dust tail and seemed to be a comet. However data from both the Hubble Space Telescope and Rosetta showed that it was an asteroid. The dust probably came from a collision with a smaller asteroid. And the fourth asteroid? This was a "near Earth object" spotted by several observatories in 2007. The Minor Planet Center gave it the designation 2007 VN84. Its trajectory would bring it to within 6000 km of the Earth's surface on November 13. That's much closer than many communications satellites. 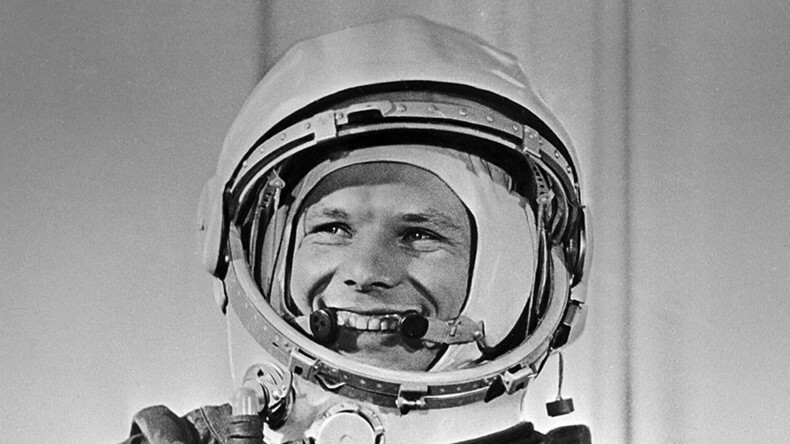 But wait a minute, thought Russian astronomer Denis Denisenko, isn't something else happening on that date? He compared the orbit of the near Earth object to that of a certain European comet chaser which was on the way home for a third gravity assist. Yes, the 'asteroid' was Rosetta. Object 2007 VN84 was quickly withdrawn from the minor planet database. After passing through the asteroid belt, Rosetta would be too far from the Sun to keep the systems operational, and there was no need to do so. On June 8, 2011 Rosetta went into hibernation. The available power kept the computer going and protected the craft from being damaged by the cold. On January 20, 2014 Rosetta's “alarm clock” went off and initiated the procedures to become active again. There was much jubilation in the control center in Darmstadt, Germany – and around the world – when the signal came that showed that Rosetta was awake again. UPDATE (2016.10.01): 2014.08.06: Rosetta made its rendezvous with the comet. 2014.11.12: Philae landed on the comet and sent back data until its battery ran down. 2015.06.14: Philae made contact, but nothing more after July 9th. 2016.09.05: Philae was found. 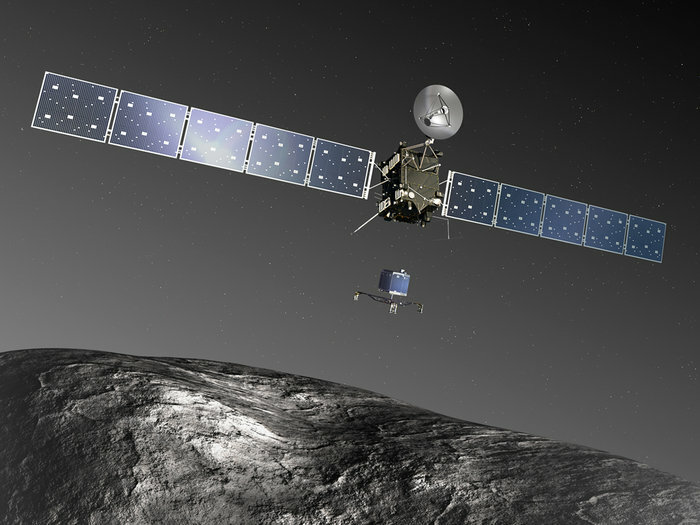 2016.09.30: Rosetta's mission ended with a controlled descent to the comet.